Hey guys! I have had a super busy morning, last night I was feeling so lazy, I could not be bothered to hang out the washing, I literally wanted to crash as I had spent most of last night, glueing my fingers together, making Leanora's Easter hat for her parade this morning and I have to say, she looked super cute along with the other children in her class. I can not believe how quick this year is going and we are already in April, with the weather undecided on what it wants to do, I mean we are what day 3 in to April and we've already had sun, showers and even hail stone's, making it super tricky on deciding on what to wear, but alas it is April, and with that comes April showers! I've created a wish list of items, to help see us through this unpredictable month and prepare us for Spring and upcoming holidays. 1. H&M Utility Dress, honestly this is a perfect item to see us into Spring. I am a major fan of all things military and having a military dress is great for day to night, teamed with some gold jewellery and some flats you will look great from sunrise to sunset. 2. Short Sleeved Cashmere Knit, A light and airy sweater to keep you warm and looking super stylish, great worn with jeans or a silky skirt. 3. Raffia Bag, This bag is high up on my owns list, it is perfect for holidays and if you have a little one it is large enough to fit everything in, plus look at the detail is so beautiful I've fallen in love with it. 4. Swimwear, I am dreaming of our beach holiday this year, I am still undecided on where to go be it Greece, Spain or Italy for some fun in the sun but where I go this and Other Stories goes too. 5. Sleeveless Lyocell Twist Knot Midi Dress, we all need a black dress, it is a classic and timepiece and a great addition to our wardrobe. I'd pair this dress with a denim jacket, some gold hoops and sandals and I am good to go and conquer the day. 6. Black Hoop Sandals from Mango, a much needed essential for a Spring wardrobe is a good stylish pair of flats, I love the hoop design in these sandals, which are very minimalist. 7. Light Wash Denim Jacket from H&M, every year I get a new denim jacket I have a slight obsession with them, they are great for layering and look good worn with just about anything, this is a super affordable one that I will no doubt be wanting to wear into the summer season also. 8. Wide leg cream H&M trousers, I love a white pair of trousers, jeans too, I do not often get to wear them as I have Miss Sticky Fingers Leanora around, but I love the shape and no doubt will be packing her off to the grandparents just so that I can wear them on a night out, with the cream knit, denim jacket and sandals and raffia bag. 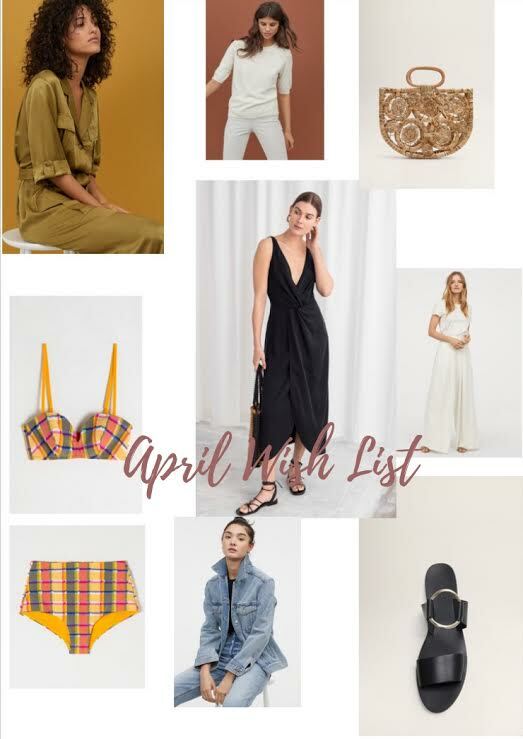 What Items are on your wish list this April?